REMEMBERING JOHN WARREN DUNCAN fly tier "Dunc"
and believe me, you would not have stood a chance besting Warren in a disagreement on many subjects. and to others, including Ron Alcott, Bob Veverka, Mike Radencich, and other excellent fly tying enthusiasts who have gone on to write their own books on fly tying. Our sport needs more Bill Hunters, and soon, if it is to survive. and the fly was perfection: I know, because as judge I appropriated the fly. Yes, the tiers were allowed to pre-prep. but to turn out tens-of-thousands of multiple stage hair-wing salmon flies that are not only perfect examples of neatness and order, but precise silhouettes of each other, is an astonishing example of accuracy on a super-human level. Taken into account that Dunc performed this achievement for over 25 years and that this was his hobby, in my judgment should earn him a place in recorded history. well, it was he. Nevertheless, if he gave you his word that he'd do something, you had better believe that he would keep it with the same natural eagerness. Dunc was a man who had many "firsts" to his credit. For example, he was the first and probably only man in Canadian history to receive three formal speeding violations on the same day, on the same road, and by the same police officer. I know, because I was present for the last two tickets: One for speeding on the way to Newcastle to pick up groceries and one for speeding on the way back. The first ticket was issued earlier that day. We fished together at least once a year during the summer (bright salmon), usually on the Miramichi, and occasionally on the St. John. Everyone wanted to fish with Warren, his personality was so appealing that anytime he showed up he attracted a crowd. I wonder if he really knew how much he was admired. Warren ranked the magnitude of his friends and acquaintances by placing their photograph or flies in specific locations in his shop in St John. I believe my photograph hung proudly in the bathroom above and behind the toilet, somewhere between Justice John Turnbull and Father Walter Lynch. the filthier the better. Ingrid, my better half, would often go joke for joke with Dunc, holding her own. Regular conversations usually lasted for over an hour with the occasional call lasting over two hours. I can never remember either of us at a loss for words, or for that matter in over 20 years, ever repeating a joke or topic of conversation. and I'll bet that the tight-fisted, penny-pinching accounts payable department at Bean still owe Dunc money. There were just as many occasions when Warren showed up at the Costello's with no ulterior destination, only to return a day later to St. John, N.B. Costello would introduce Dunc to the group and then encourage him to recite Robert Service poems and tell jokes. Each year maybe there would be one or two new people so the rest of us had to endure some of the same material, but there would always be a few new poems and funny stories. After 30 minutes of reciting prose without missing a verse and to the amusement of the crowd, Costello would egg-on Warren to tie a few flies in the basement tying room. The man was a saint to put up with Costello. But that was Dunc. There was no "no" in his vocabulary, when it came to pleasing his friends. At the trade shows I often watched Warren sit patiently and courteously listening to everyone and anyone who had a question or idea, no matter how correct or outrageous, whether you were a professional athlete or you washed dishes. He would always offer a helpful word of encouragement and his views were usually right-on. they said it was a massive heart attack. We will never be able to measure the loss of his genius at the vice except through the flies he left us and through the memories of friends and family. He is survived by his wife of 36 years Anne, his son John and daughters Catherine and Christine, his sister Joan and grandson Duncan. 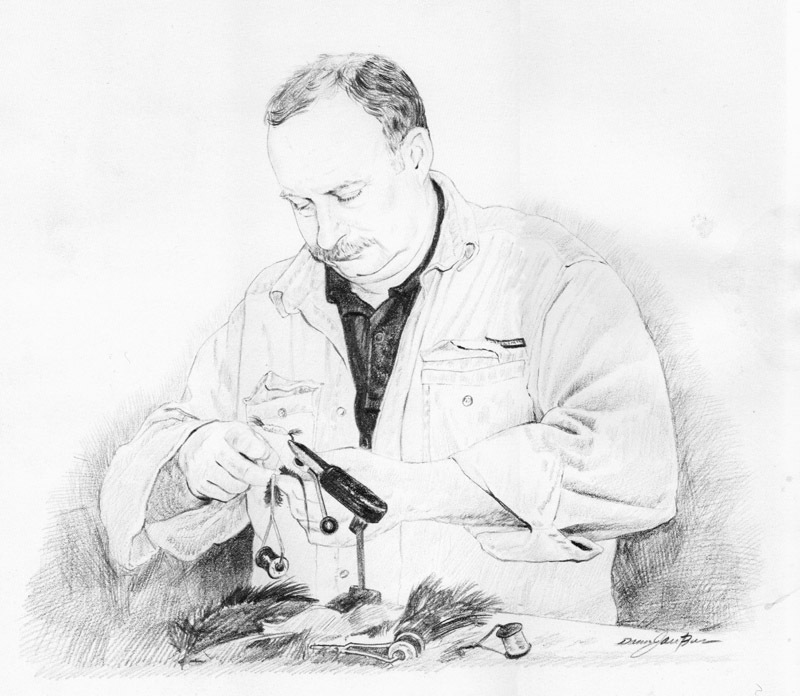 NOTE: Art of Angling Journal published a profile on Warren Duncan in 2004, just prior to his retirement. It is located in Volume 2 Issue 4, pages 130-152.